Product prices and availability are accurate as of 2019-03-16 02:23:24 EDT and are subject to change. Any price and availability information displayed on http://www.amazon.com/ at the time of purchase will apply to the purchase of this product. 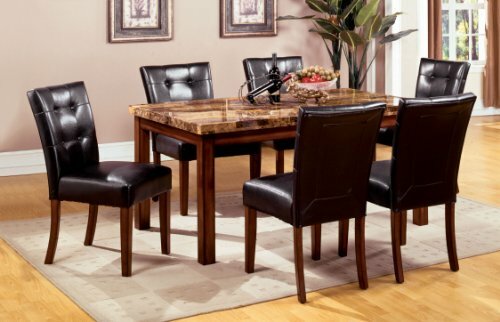 Add some texture to your dining space with this faux marble topped dining table set. Featuring solid wood construction that's enhanced by a rustic dark oak finish, the sturdy table is an amazing piece in any space-limited area. Each chair features a padded leatherette Parson style back with button tufted accents and fire retardant seat cushions. The table comes in two different sizes to accommodate a variety of dining spaces. Available as 60-Inch long or 48-Inch long. This set includes one dining table and six dining chairs. 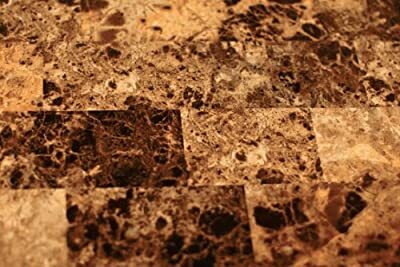 Avoid placing overly hot items directly onto the table top to maintain the unique faux marble exterior. To clean, simply wipe down with a slightly damp, non-abrasive cotton cloth. Some wood protectants may be used but please use at your own discretion. We highly recommend against using harsh chemicals that may damage the finish. Manufactured in China, some assembly required. Table: 60"L x 36"W x 30"H; Chair: 18.5"W x 23.5"D x 38"H; Seat height: 20.75"; Seat depth: 17.75". 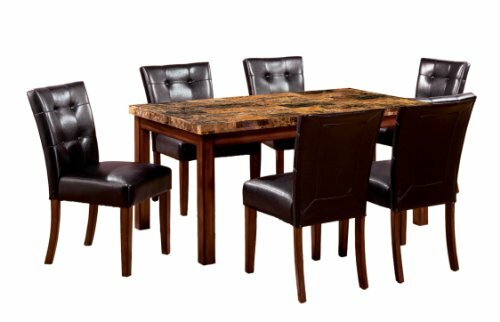 Set includes: (1) 60" Dining Table and (6) Side Chairs Faux marble top sits sturdily on solid wood construction Padded leatherette Parson style chairs feature button tufted backs and fire retardant cushions Table: 60"L x 36"W x 30"H; Chair: 18.5"W x 23.5"D x 38"H; Seat height: 20.75"; Seat depth: 17.75"